On July 15, 1995 at the very start of ZetaTalk, the Zetas presented the New Geology to come, where the new Equator would run through the Bering Straits, down the Pacific past the West Coasts of North and South America and thence through Antartica and up the Atlantic to Greenland. Nancy drew a map showing the Zeta concept of this new geology. The Vision given to Nancy by the Zetas, which Nancy documented, stated that the new N Pole wouuld be off the bulge of Brazil, and the new S Pole over India. Positioned over North America, I see a line moving from the North Pole to just off the bulge of Brazil, out in the Atlantic Ocean. Then the Earth turns beneath me toward the east, until I am positioned somewhere over the Pacific Ocean, so that I can see the end point of a line moving from the South Pole to the center of India. 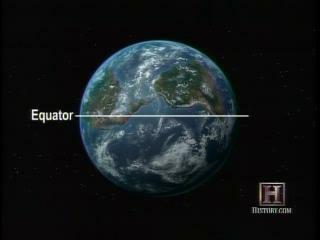 The pole shift, with consequent realignment of the poles, will place the New Equator over formerly frozen lands. Greenland, Canada, Alaska, Siberia, and Europe will be affected by the new equator. In 2007 the History Channel produced a documentary called Doomsday 2012: the End of Days. 16:37 into the first hour, they talk about pole shifts causing crustal shifts, and depict such an occurence that supposedly happend 800 million years ago with the Equator running down the center of the Pacific. Why depict this when talking about what to expect for 2012? There is no other source in print or on the web for such a depiction of the geology to come, with Antartica and Alaska on the new Equator, except at the ZetaTalk website. Nor did the History Channel depict any other potential new geology in their documentary.